Serves 4. Preparation time 10 minutes. Cooking time 10 minutes. • Separate the tentacles from the head and discard the head with the hard bone. Reserve the tentacles, slice open the tubes and score the flesh. • In a pan, fry the bacon cubes, cumin, red pepper, spring onion, chilli and garlic until cooked and remove with a slotted spoon. Using the same pan with the juices, toss in the tubes and tentacles. Stir-fry for a few minutes over a high heat Remove from the heat as soon as the calamari turns opaque. 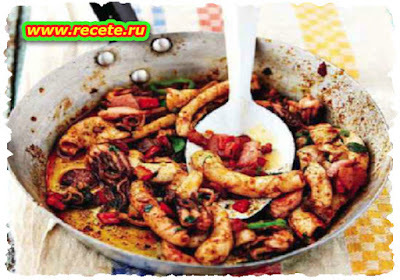 • Return the bacon and pepper mix to the pan. Add the paprika and parsley and give the pan a shake to heat through. • Serve immediately with a generous squeeze of lemon juice, and bread to mop up the juices.